As a bookseller who did not major in English Literature, I feel like my writerly knowledge can be somewhat hit or miss. Confession time: I’ve read little of Woolf, Eliot, and Forster, and nothing of Lawrence. So thank goodness for this intensely researched, intricately woven, and adroitly written group biography, focusing on a moment when everything changed, and modernism began to pervade the cultural consciousness. It’s an intimate and personal journey, and at the same time, a light into the creative minds of the day, not just of the featured players, but also of the two writers who influenced them, Marcel Proust and James Joyce. Think of it as a nonfiction version of Colm Tóibín’s The Master. And in a true mark of success, The World Broke in Two made me hungry to go back and read more of Virginia, Tom, Morgan, and David (Bert to family). Some years mark a stark division, separating what comes before from what comes after in uncompromising and irreversible terms: 1776, 1865, 1945 are obvious examples. For literature, 1922 is such a year. Bookended by the February publishing of James Joyce's Ulysses, considered by many to be the single greatest novel in the English language, and the translation of Marcel Proust's In Search of Lost Time in the fall, the year marks a clean break from traditional forms of linear narrative storytelling, and plunges us deep into the psychological explorations and innovative structures of modernist writing. As Willa Cather reflected in 1936, "The World Broke in Two in 1922 or thereabouts." Goldstein's book is a lively, nuanced, and utterly enthralling tale of how this break affected four writers in particular: Virginia Woolf, TS Eliot, EM Forster and DH Lawrence, who all struggled with and found renewed inspiration from this new world. 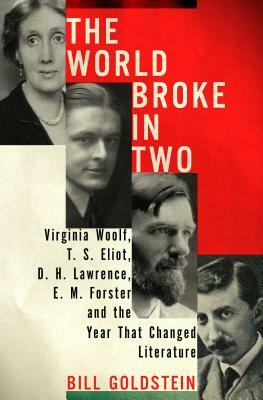 I am so impressed with the research and detail that author Bill Goldstein put into The World Broke in Two that I feel as though I've been transported back to 1922 on a literary journey where I'm sitting at a roundtable discussion with Virginia Woolf, E. M. Forster, T.S. Eliot and D.H. Lawrence as they share the intense struggles they're having in trying to break out of writer's ‘inanition’ and meet the war weary readership whose world has been changed forever. This is an engaging and enlightening view into the birth of modernism in literature and is the best nonfiction I've read this year.